Over the past 15 years, many studies in adults suggest that obesity via inflammation, insulin resistance, visceral adiposity, and central neural mechanisms (e.g., hypofunctioning hypothalamic CRH) play a role in the pathogenesis of sleep apnea, sleepiness, and the associated cardiovascular comorbidities. 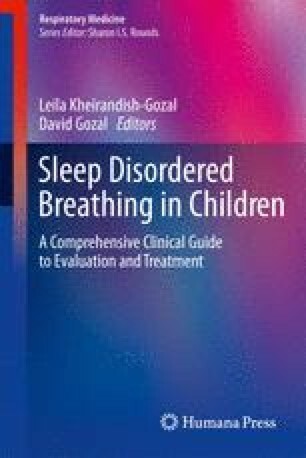 In contrast to adults, in children, until recently, the predominant belief was that anatomic rather than metabolic factors were primary in the development of sleep-disordered breathing (SDB). Adenotonsillectomy is the first line of treatment while the potential role of obesity has been overlooked. However, in the Penn State Child Cohort, obesity was the strongest risk factor for mild and moderate SDB. This chapter reviews studies that show that SDB in obese children shares many similarities with SDB in obese adults. Both SDB and obesity appear to be associated with increased excessive daytime sleepiness (EDS), inflammatory markers, and leptin and a decrease in adiponectin.